1) 12 Jun 2003: pp 146-7, child (1) of person 214, ". 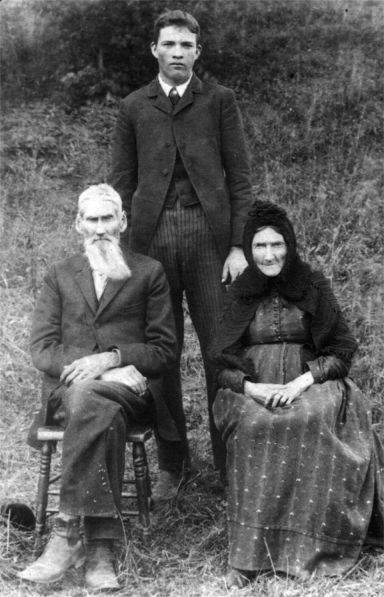 . . Susan Brower [incorrectly, Brown], born 1 May 1822, daughter of Abram and Ann (Northall) Brower. 2) 12 Jun 2003: p 415, person 468, paragraph 2, add this further information about John R. Pierce family: "John and Frances have been married about four years." 6) 21 Jun 2003: p 388, person 447: Append this paragraph to the sketch for Guy Holt: "Rackham Holt was a book critic for the Chicago Daily News in the 1920's and early 1930's. 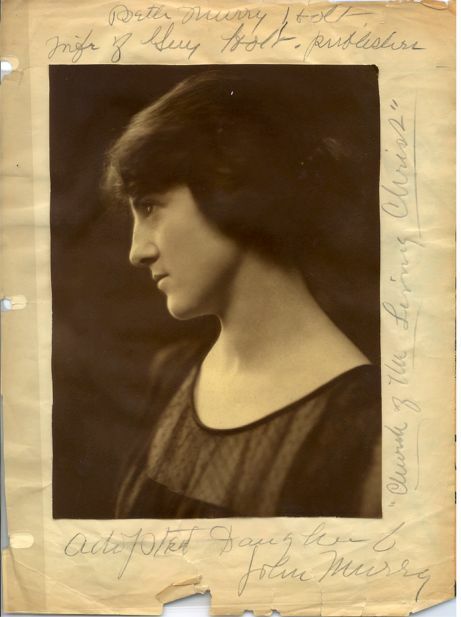 She was a book editor at Book List and G. P. Putnam's Sons in New York, and a librarian in the Chicago and New York public libraries. 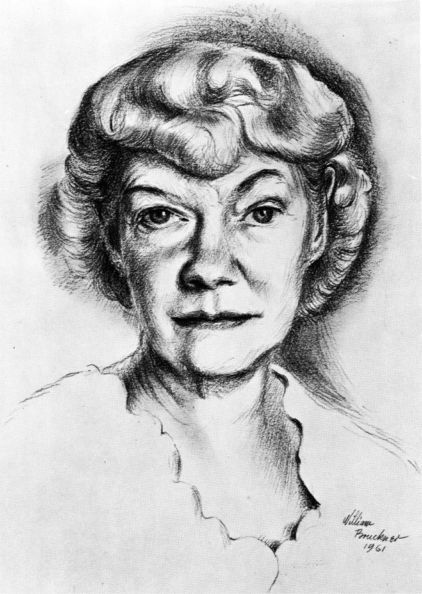 Rackham is particularly noted for her biographies of African-American notables, scientist George Washington Carver and educator Mary McLeod Bethune. The Carver book is dedicated to her daughter Margaret V. Holt. Rackham was also the ghost writer for Margaret Sanger's An Autobiography and Victor Heiser's An American Doctor's Odyssey. Rackham was one of the prominent literary figures of the late 1940's who spoke up in defense of best-seller Howard Fast who was put in prison for a year by the House Un-American Committee, for refusing to give names to the committee." 8) 23 Jul 2003: p 202, paragraph 2, sentence 1: Replace with "Cyrus married (2) 16 May [or August] 1822 PHOEBE (WADE) WOODRUFF, born 15 November 1791, Springfield, New Jersey, daughter of Isaac and Lois (Osborn) Wade. Phoebe was the widow of Rich Stites Woodruff, who died 12 November 1814, not long after their marriage on 7 October 1813, and with whom she had one child, William Stites Woodruff, born 26 September 1814. Phoebe died 6 December 1891, aged 100." 9) 23 Jul 2003: p 209, paragraph 2, line 1: Change "with the biography above" to "with the biography above and a Wade genealogy". Line 5: change "Emma" to "Emma E." and "Berwick" to "Berwick [Bervic]". Line 6: change "died at five months" to "died 16 March 1827" and change "Juliette P." to "Juliette Paradise". Line 7: change "1827" to "1827, married W. H. Sherman" and change "Berwick" to "Berwick [Bervic]". Line 8: change "New York" to "New York, married Sarah Mersereau". Add to footnote , before the closing period, "; Wade, Wade Genealogy, 314". 10) 31 Jul 2003: p 192, paragraph 1, last line: Add footnote: "1845." changes to "1845." 11) 3 Oct 2003: p 429, person 490: Change "Kelsy11 Latta," to "Kelsey Durand11 Latta,". 12) 11 Nov 2003: pp 395-399, person 382: Add two figures. On p 395, insert nickname ["Bill"] after "Henry Wilson." On p 399, person 450, insert nickname ["Billy"] after "Wilson". 13) 12 Nov 2003: p 415, person 467: Add this paragraph: "In 1930 John Starr, [2? ]9, a machinist in a cement plant born in Colorado of German parents, resides in West Riverside, Riverside Co., California, with his wife, Rowena, 25, born in Colorado of a father born in Kansas and a mother in New York, and with daughter Margie H.9, 6, born in Arizona, and son James W.9, 1, born in California. John was 2[2?] at first marriage and Rowena was 1[8?]." For consistency, change line 2 of the first paragraph to "and married, about 1923, John George Starr, born about 1901, Colorado." But see addition 21 below. 14) 23 Nov 2003: pp 287-292, person 286: Add figure. 15) 24 Nov 2003: p 151, person 222: Change "died 7 March 1849," to "died 7 March 1849, Jefferson's Village, aged 56,". Append this sentence to paragraph: "Abigail, born about 1795, died 6 October 1828, Jefferson's Village, aged 33." 16) 24 Nov 2003: p 217, person 206: Change "2 April 1821," to "2 April 1821, Bloomfield, Essex Co., New Jersey,". Change footnote  to: "Bates, Maplewood, 15; New Jersey Eagle [newspaper], Newark, New Jersey, 6 April 1821, from biographical card file, New Jersey Historical Society (NJHS), Newark: "Durand, Asher Brown, engraver, of N. Y. | mar. at Bloomfield 4/2/1821 by Rev. Gideon | N. Judd to Miss Lucy Baldwin, dtr. of |Isaac Baldwin of Bloomfield;" Centinal of Freedom [newspaper], Newark, New Jersey, 10 April 1821, biographical card file, NJHS: "April 2, 1821 | Durand, Asher B. | to | Baldwin, Lucy | dau. of Isaac Baldwin of Bloomfield (by) Rev. Mr. Judd, at Bloomfield." 17) 24 Nov 2003: p 149, person 217: Change "5 August 1821," to "5 August 1821, Jefferson's Village, Essex Co., New Jersey," and insert at beginning of footnote : Centinal of Freedom, [undated], biographical card file, NJHS: "Aug. 5, 1821 | Durand, Mr. Caleb | Jefferson's Village;". Change "married" to "married 1 November 1797". 18) 25 Nov 2003: p 209, person 204: Append to footnote : "Sentinel of Freedom, 4 June 1844, biographical card file, NJHS: "May 29, 1844 | Durand, Jane W., dau. of Cyrus Durand | to | Chapman, Rev. John L. Chapman, all of Clinton-|ville, N. J. | At Clintonville, by Red. [sic] Dr. Ferris." 19) 25 Nov 2003: p 141, person 200: In footnote : Change "Marriage" to "Biographical card file, NJHS: "Freeman, Rufus of Orangedale | married 11/30/1806 to Mary Durand of Springfield | by Rev. John McDowell, E.-T. [Elizabethtown] | Co. C. Essex [County Clerk, Essex Co.]; Marriage"". 20) 25 Nov 2003: p 146, person 211: Append to footnote : "Biographical card file, NJHS: "Clay, Thomas | married 10/19/1799 to Phebe Durand, both of North | Farms | L. F. Ch. [Lyons Farm Church records]."" 21) 30 Nov 2003: p 415, person 467: Change "Starr" to "Starr [Stariha], born 25 December 1900, Aspen, Pitkin Co., Colorado, son of Matthew and Mary (Kump) Stariha, born in Croatia. 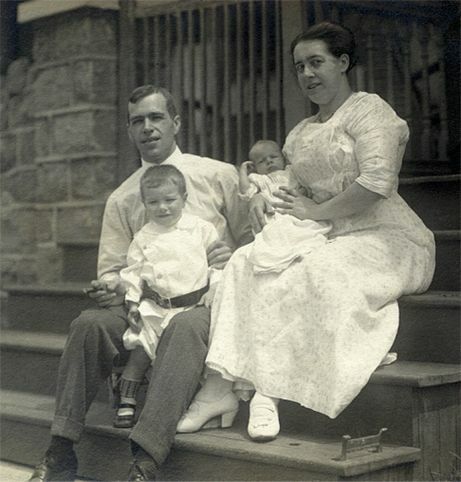 Rowena and John Starr had three children: (1) Margaret9 Starr, born about 1923, married Jack Edwards, both now deceased, and had children Gary10, Kim10, Karen10, and Maria10 Edwards; (2) James9 Starr, married Pat --, and had children Gretchen10 and Heidi10 Starr, born in Sacramento, Sacramento Co., California; and (3) Dorothy Jean9 Starr, born 3 December 1931, Riverside, Riverside Co., California, married Verlin Wesley Davis, who was born 17 March 1927, Kimball, Brule Co., South Dakota, son of Philip Hartland and Tracey Fae (French) Davis, and had daughters, Carlene10 (Davis) Basped and Valerie Lynn [now Andii]10 (Davis) Gibb, born in Sacramento." Also, add Andii10 Gibb to the list of family member researchers in the Acknowledgments section. See addition 13 above. 22) 3 Dec 2003: p 151, person 221, footnote : append "biographical card file, NJHS, "Durand, Daniel | married 8/19/1805 to Miss Phebe Brown of Jeffer-|son Village by Rev. Stephen Thompson, Conn. Farm|s| Co. C. Essex." "
22) 3 Dec 2003: p 147, person 214, footnote : append "biographical card file, NJHS, "Durand, Elias B. | married 4/30/1840 to Susan Brown both of Clin-|ton by Rev. Robert Street, Conn. Farms | Co. C. Essex." "
23) 3 Dec 2003: p 146, person 214, line 3: change "New Jersey, Betsey Baker" to "New Jersey, Betsey Baker". 24) 3 Dec 2003: p 196, person 199, lines 3-4: change "10 August 1846, South Orange, New Jersey, married, 18 July 1805" to "10 August 1846, Jefferson Village, aged 66, married 18 July 1805,". 25) 3 Dec 2003: pp 142-3, person 204, lines 1-2: change "married" to "died 10 July 1821, Jefferson Village, New Jersey, aged 29, married 16 May 1819, Jefferson Village,". Also change "Nancy Smith." to "Nancy Smith, died 8 September 1821, Jefferson Village.". This has the effect of deleting the current footnote . 26) 15 Dec 2003: photos of Samuel Relf8 Durand and his Hildur Richardson, contributed by his grandson Derek10 Doran-Wood, should be associated with the dedication of the book in some manner. 27) 15 Dec 2003: p 146, person 212, line 2: Insert "Connecticut Farms, " before "Essex Co." Append to footnote : "Biographical card file, NJHS: "Brown, Thomas | married 3/4/1809 to Rhoda Durand by Rev. Steph-|en Thompson, Conn. Farms | Co. C. Essex."" 28) 16 Dec 2003: p 151, person 218, lines 1-4: A tighter argument proceeds from deleting the sentence "The first child of the second marriage ... 1812." but preserving its footnote number (which becomes associated therefore with the preceding sentence, "Then Hannah died ... more children." In this preceding sentence change "married, second," to "married, second, 11 February 1810,". Change foonote  to read "Biographical card file, NJHS: "Mulford, William | married 2/11/1810 to Betsey Ludlow by Rev. | Thomas Picton, Westfield." "
29) 16 Dec 2003: p 138, person 46, paragraph 1, line 3-: change "1832" to "1832, aged 73,". 30) 16 Dec 2003: p 138, person 46, paragraph 1, line 2: change "1813" to "1813, aged 67,". 31) 16 Dec 2003: p 209, person 205, line 2: change "9 October" to "8 or 9 October", and line 3: change "married" to "is buried in the Old Presbyterian Churchyard, Springfield, Essex Co., and married". Insert at beginning of footnote : "Biographical card file, NJHS: "Durand, John | died 10/8/1821 in his 28th yr. | Springf. Ch. Inscr. ;" Centinal of Freedom, [no date], NJHS: "Durand, Mr. John | engraver of New York | At Jefferson's Village | Aged 27;" "
32) 6 May 2004: p 140, person 46, insert a new paragraph after the first complete paragraph on this page: "At a town meeting in Newark on 14 March 1786, John "Duren" is chosen "Overseer of the Highway," one of many. Then at the meeting held 23 April 1787, John Durand is again chosen an overseer of the highway." 33) 6 May 2004: p 145, person 49, insert a new paragraph after the first complete paragraph on this page: "At a town meeting in Newark on 27 April 1789, Elijah Durand is chosen overseer of the highway, as had his brother, John, in 1786 and 1787, as previously mentioned." 40) 17 May 2004: p 88, person 25, Andrew Durand, first full paragraph, line 4: Insert after first sentence this new sentence: "On 24 September 1757 Andrew Durand of New Cheshire offers a reward for a strayed bay horse." 42) 20 Dec 2004: p 33, first paragraph: Append this sentence. "Evidence of the ongoing relationship between the Andrew branch and Yale is the Durand Cup [see photo], named in honor of Prof. Loyal9 Durand III [cf. footnote 1392 on p. 277]." 45) 9 Jan 2006: p 81, second paragraph of sketch for Susannah Durand, change "Known child ... :" to "Children:" and make Reuben Hawkins a second child and [daughter] Hawkins a third one, with the baptisms as given. I did not list the children this way before because I was not convinced that Susannah was still married to Peter Hawkins at the times of the baptisms of the two later children. Mr. Lynn E. Garn has proven this so to my satisfaction. See next items. 52) 2 Nov 2014: p 86: change footnote 455 to: "Beach, "Durand," 80 gives birth date 8 Jan. 1807 but this is inconsistent with the second Moose Hills deed of 30 Mar. 1805 which mentions 'Bennet', son of Joseph Durand. He is Bennett Durand in Beach." 53) 2 Nov 2014: p 86: change death date for Ebenezer B. to "25 March 1883, Bristol, Hartford Co., Connecticut," and add a footnote to it: "Connecticut, Deaths and Burials, 1772-1934, <www.FamilySearch.org>, Ebenezer B. Durand, died 25 Mar. 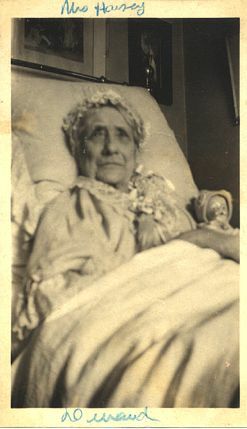 1883, Bristol, Conn., age 70, FHL 3324. Beach gives 25 Mar. 1884." Add: "buried, aged 76, in Forestville Cem., Forestville, Hartford Co., Connecticut. ", with s footnote: "Find a Grave, no. 120657146, gravestone photograph, by C. Greer, Forestville Cem., Forestville, Hartford Co., Conn., 'D | Ebenezer B. Durand | died | Mar. 25, 1883 | aged 76 yrs. | Clarissa | his wife | died Aug. 23, 1906 | aged 92 yrs. | Durand [with inscriptions on two other sides of the monument for two daughters and their husbands].'" 54) 2 Nov 2014: p 87: add Clarissa's death date: ", and died 23 August 1906, and buried, aged 92, next to her husband." 56) 2 Nov 2014: p 84: change Sarah's second sentence to "Beach has her death in 1880. She married 13 Dec. 1815, Oxford, John Payne, of Cornwall, Litchfield Co., Connecticut." and change the footnote 433 to: "Cornwall VRs (Barbour), 36, "[Durand] Sarah, of Oxford, m. John Payne, of Cornwall, Dec. 13, 1815, in Oxford, by Rev. Aaron Humphre, of Oxford. Beach hs that they 'moved to Ill. and are all dead.'" 57) 2 Nov 2014: p 87: insert this 1860 census record: "In 1860 Ebenezer Durand, 53, keeping a boarding house born in Connecticut, resides in Bristol, Hartford Co., Connecticut, with his wife Clarissa, 46, born in Connecticut, Mary Jane, 26, Sarah M., 22, a music teacher, and Martha J., 17, a teacher, all three born in Connecticut." and add a footnote for it: "U.S. census, 1860, Bristol, Hartford Co., Conn., dwelling 470, family 459, roll 102, p. 52. There are many other people in the household." Family Bible of Ann Brower, photocopies sent to the author on 12 Jun. 2003 by Marianne8 (Durand) Frey: Holy Bible: containing the Old and New Testaments: together with the Apochrypha, etc. (New York: E. Duyckinck, Smith and Forman, Collins and Co., J. Tiebout, S. A. Burtus, and B. Crane, 1812), inscribed, "The Property of Ann Brower, June 15th, 1813." Contains the records, "January 1, 1786 Ann Northall was born at 5 oclock in the Aprel [sic] 12, 1788," "Ann Brower wif of Abram Brower Died September the 28, 1828," and "Abrahm Brower son of William Brower died June the -5- 1844." U.S. census, 1910, New York City, New York Co., New York, E.D. 1177, roll 1043, p 237, sheet 4B, dwelling 66, family 77, address 5 W. 47th St.
 George Washington Papers at the Library of Congress, 1741-1799: Series 5 Financial Papers, <memory.loc.gov/ [search on Durand]> (accessed 18 Jun 2003), Briant Durand to George Washington, June 21, 1780, Revolutionary War Accounts, Vouchers, and Receipted Accounts 2, image 195. Obit., Publishers Weekly, Vol. 183, No. 7, 18 Feb. 1963, 135, Contemporary Authors Online, Gale Group Databases, Gunn Memorial Library, Washington, Conn., 21 June 2003, <www.infotrac.galegroup.com>, courtesy Shelley Holmes Caroe, article states, "she was widow of Guy Holt, who was head of McGraw-Hills trade department when he died in 1934;" Adele (Durand) Holt, "Stage Careers in the Durand Family All Sparkle with Brilliance," The Peru Republican, 28 Apr. 1944, 1, states, "[Guy Holt, her son] passed away in 1934. Rackman [sic] Holt is his widow. Her latest book "George Washington Carver" has been one of the non-fiction's best sellers for the past year;" Robert Harry McIntire, "The MacIntyre, McIntyre and McIntire Clan of Scotland, Ireland, Canada and New England," typescript, 1949, 15, HeritageQuest Online, <www.genealogy.com> (accessed 20 June 2003), gives her pseudonym as "Rackem." 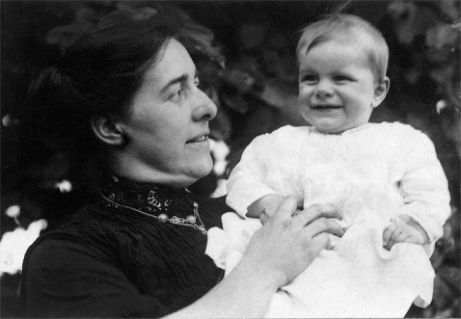 Durand, "Notes on Family History," has daughter Margaret born 11 Oct. 1925. Obit., Publishers Weekly, 18 Feb. 1963; Rackham Holt, George Washington Carver: An American Biography (Garden City, N.Y.: Doubleday, Doran and Co., Inc., 1943), had been through 22 printings at the time of this review; Rackham Holt, Mary McLeod Bethune: A Biography (Garden City, N.Y.: Doubleday and Co., Inc., 1964). 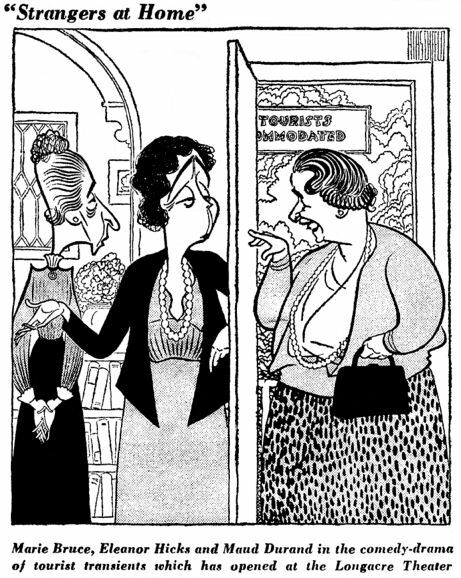 Obit., Publishers Weekly, 18 Feb. 1963; Margaret Sanger, An Autobiography (New York: W. W. Norton and Co., 1938); Victor George Heiser, An American Doctor's Odyssey: Adventures in Forty-Five Countries (New York: W. W. Norton and Co., 1936). "Prominent Literary Figures Speak Up For Howard Fast," Daily Worker, 11 Oct. 1947, 11, online at <www.trussel.com/hf/prominen.htm> (accessed 21 June 2003), lists in addition Arthur Miller, Ted Ward, A.J. Liebling, Richard Boyer, Angus Cameron, and Louis Untermeyer. 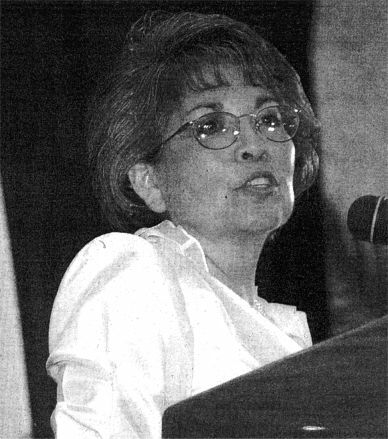 Amber Chavez, "N.M. Chief Justice Honored: Maes receives state award for accomplishments," Albuquerque Journal, Albuquerque, New Mexico, 28 June 2003. Stuart Charles Wade, The Wade Genealogy: Being Some Account of the Origin of the Name, and of the Lost Folkstory of the Famous Hero, Wada, Particulars and Pedigrees of Famous Englishmen of the Name, and Genealogies of the Families of Wade of Massachusetts and New Jersey, to which are Added Many Miscellaneous Pedigrees: also, a Roll of Honor of the Wades Who Went to War (New York: self-published, 1904), 277-78, 314-16. Henceforth cited as Wade, Wade Genealogy. Phoebe's brother, Elias Wade, was an engraver of Durand, Wright & Co. [S. Whitney Phoenix, The Whitney Family of Connecticut, and Its Affiliations; Being an Attempt to Trace the Descendants, as well in the Female as the Male Lines, of Henry Whitney, from 1649 to 1878; to which is Prefixed Some Account of the Whitneys of England (New York: privately printed, 1878), 408. Nancy Gorham married first, 1 Aug. 1819, New Bedford, Mass., Allen Bourne [Marriage Index: Massachusetts, 1633-1850, FHL 199393]. Email from Nancy Sue10 Latta, 3 October 2003, "Re: Durand Book." U.S. census, 1930, West Riverside Twp., Riverside Co., California, ED 88, roll 184, pp. 15A-B, dwelling 351, family 354. The <Ancestry.com> index gives his age as 29. Newark Daily Advertiser [newspaper], Newark, New Jersey, 13 March 1849, from biographical card file, New Jersey Historical Society (NJHS), Newark: "March 7, 1849 | Durand, Josiah, in 56th year | Died at Jefferson Village." Centinal of Freedom [newspaper], Newark, New Jersey, 11 November 1828, biographical card file, NJHS: "Oct. 6, 1828 | Durand, Mrs. Abigail B. | At Jefferson's Village | Aged 33." Centinal of Freedom was later spelled Sentinel of Freedom. Centinal of Freedom, 8 November 1797, NJHS: "Wednesday Evening last | Durand, Caleb B. | of Springfield | to | Brown, Mrs. Hannah | of South Orange | by | Rev. 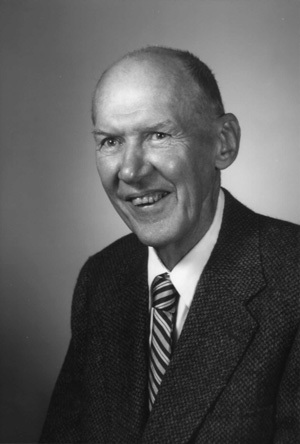 Jacob Van Arsdale." A puzzle is this item: Centinal of Freedom, 3 February 1818, biographical card file, NJHS: "Thursday Evening last [29 January 1818] | Durand, Caleb B. | to Butler, Margaret | of Staten Island | by | Rev. Mr. Jones." This suggests that Caleb had a second wife, but first wife Hannah outlived Caleb and there is no indication of divorce. She is described as his widow on her gravestone and is buried next to him. So perhaps there was a second Caleb (cf. person 216) after all. New Jersey Journal and Elizabeth Gazette [newspapers], Elizabeth, New Jersey, 21 May 1822, biographical card file, NJHS: "May 16, 1822 | Durand, Capt Cyrus | to | Woodruff, Miss Phebe | by | Rev. Mr. Frazer." The same card file also contains this item: "Durand, Silas [sic] | married 5/16/1822 to widow Phebe Woodruff of Spring-|field | Hist. West. Ch." Emails from descendant Andii Gibb to the author, 27 and 30 November 2003: "They [John and Rowena] were married before her 18th birthday so she lied and said she was born in 1902 at the time of their marriage in Denver." Also, "Rowena's parents were George Durand of Denver and I can't remember my great-grandmother's name, either Bacon or Bowman." Biographical card file, NJHS: "Durand, Ezra | married 10/24/1818 to Betsey Baker both of Conn. | Farms by Rev. Stephen Thompson, Conn. Farms | Co. C. Essex [County Clerk, Essex Co.]." The Eagle [probably The New Jersey Eagle, Newark], 14 August 1846, NJHS: "Aug. 10, 1846 | Durand, Henry | At Jefferson's Village." Centinal of Freedom, 23 July 1805, NJHS: "Durand, Henry | to Baldwin, Lecta | both of Jefferson Villiage [sic]." Centinal of Freedom and New Jersey Journal [probably of Elizabeth], 7 August 1821, NJHS: "July 10, 1821 | Durand, Mr. Isaac M. | At Jefferson's Village | Aged 29." Biographical card file, NJHS: "Durand, Isaac | married 5/16/1819 to Nancy Smith of Spring-|field by William Brown, Just. 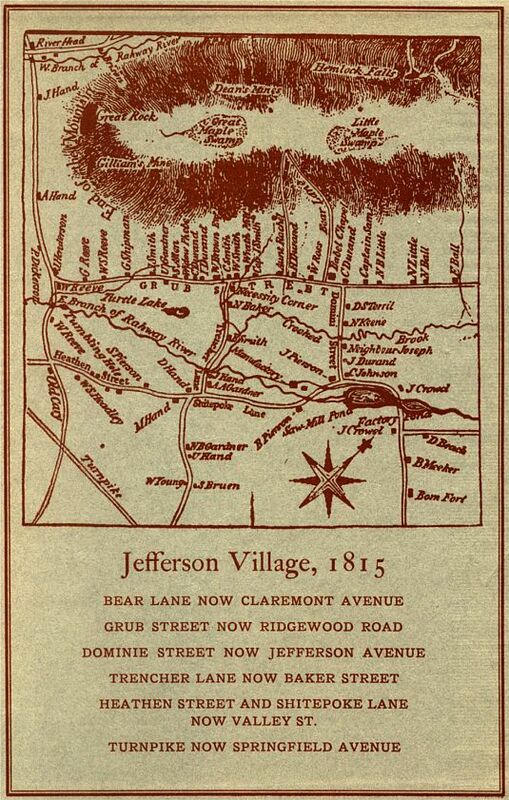 of the peace, | Jefferson Village | Co. C. Essex." Centinal of Freedom, [no date], NJHS: "Sept. 8, 1821 | Durand, Mrs. Isaac | At Jefferson's Village." Biographcal card file, NJHS: "Durand, Rachel, wife of John Durand | died 4/26/1832 in her 74th yr.| Springf. Ch. Inscr." Biographcal card file, NJHS: "Durand, John, | died 6/25/1813 in his 68th yr.| Springf. Ch. Inscr." Collections of the New Jersey Historical Society. Volume VI. Records of the Town of Newark, New Jersey from Its Settlement in 1666, to Its Incorporation as a City in 1836 (Newark, NJ: NJ Historical Society, 1864; repr. paperback, NJHS, 1966) [henceforth cited as Town Records of Newark, 1666-1836], 162, 164. Asher Brown also chosen overseer of the highways at the 1786 meeting. Town Records of Newark, 1666-1836, 167. "Essex Co. Gravestones", 14, "Durand, Henry ("our father"), Nov. 2, 1780, d. Aug.10, 1846; wife Electa Baldwin, b. Jan. 7, 1786, d. Oct. 18, 1865." "
 Kenneth Scott and Rosanne Conway, Genealogical Data from Colonial New Haven Newspapers (Baltimore, Maryland: Genealogical Publishing Co., 1979; repr. Baltimore: Genealogical Publishing Co., 1999), 51. Wright Brothers Memorial Trophy, <www.nasm.si.edu/research/aero/trophy/wright.htm> (accessed 10 November 2004), was awarded secondly to Charles Lindbergh. Litchfield Co., Conn., Deeds, 11: 220. Litchfield Co., Conn., Deeds, 12: 289. Litchfield Co., Conn., Deeds, 11: 264. Litchfield Co., Conn., Deeds, 12: 225. Litchfield Co., Conn., Deeds, 12: 31. U.S. census, 1850, Pittsfield, Berkshire Co., Mass., roll 305, p. 276, dwelling 1357, family 1516, lists Reuben Hawkins, 61, farmer born in Conn., real value $20,000, with 12 males and 26 females, including Clarissa Hawkins, 56, born in Conn.; U.S. census, 1860, Pittsfield, Berkshire, Co., Mass., roll 488, p. 283, dwelling 2063, family 2205, lists Reuben Hawkins, 70, a teamster born in Conn., with $26,500 real and $1,820 personal property, listed with nine other males and 24 females, including Clarissa Hawkins, 66, an "elderess" born in Conn.
 U.S. mortality index, 1870, Pittsfield, Berkshire Co., Mass., dwelling 1526 [Pontoosue Boarding House], Reuben Hawkins, 80, an elder born in Conn., died Feb. of apoplexy. Rachel Cottrell, "Shaker Death Records," Register 115 [Apr. 1961]: 126-26. Original records on FHL 1902437. U.S. census, 1860, ward 15, district 2, New York City, New York Co., New York, roll 805, "Page No. 72," dwelling 233, family 437, lists Jno Durand, 37, engraver, born N.Y., Fredk F., 21, student, born N.Y., A. B., 13, artist, born N.J., Eugene, 9, born N.Y., Caroline, 33, born N.Y., and two servants; New York State census, 1855, ward 15, district 4, "the city,", New York Co., dwelling 9, family 10, lists Asher B. Durand, 58, husband, painter, born N.J., Mary F., 42, wife, born N.Y., Caroline D., 28, daughter, born N.Y., "Fredrick D.," 15, son, born N.Y., and "Euguene" H., 3, son, born N.Y.
 Connecticut State Archives, RG3, New Haven Superior Court Files 1717, Murder of Thomas Sperry by Ebenezer Allen, Statement of John Durand after examining the body. Letter to the author from Sandy Filleman, 4 Nov. 2006; email from Joelle Lambert, 25 Nov. 2006. Obit., "Nelson C. Durand, 77, Thomas Edison Aide," The New York Times, 21 Jul 1949, "East Orange, N.J., July 20 -- Nelson C. Durand of 116 Prospect Street, retired vice president of the Ediphone Division of Thomas A. Edison, Inc., and one of the early associates of the late inventor in the development of the incandescent lamp and in the development of voice writing, died last night at his home after a five-day illness. He was 77 years old. [paragraph] A native of Newark, Mr. Durand entered the former Edison Lamp Works in Harrison when he was 16. Subsequently he did engineering work during the early days of the bamboo filaments, pioneering on such events as the erection of the first electric light sign in New York at Twenty-third Street and Broadway. [paragraph] Mr. Durand was made vice president and general manager of the Ediphone Division in 1904 and retired on Jan. 31, 1938. He was the first to be given the title of 'vice president' in the company." 1) 14 Oct 2003: p 543, place index, Iowa: Benton Co. is listed twice. The second set of entries should be deleted. 4) 10 Nov 2003: p. 387, person 447: The author met 6 Nov 2003 with Sandra Lee Filleman in Las Cruces, New Mexico, and discovered a photograph in her collection from Maud Durand's scrapbook labeled "Beth Murry Holt wife of Guy Holt, Publishers [photo] Adopted Daughter of John Murry." Pasted to the opposite side of the page is another photo of the same woman with a young girl, labeled "Adopted Daughter of John Murry". Next to the photo is an obituary for Guy. The authority for the name of Guy Holt's first wife, Caroline Elizabeth Morse, as given in the book, was Maud Durand's "Notes on a Family History." Thus we are left with a quandary. 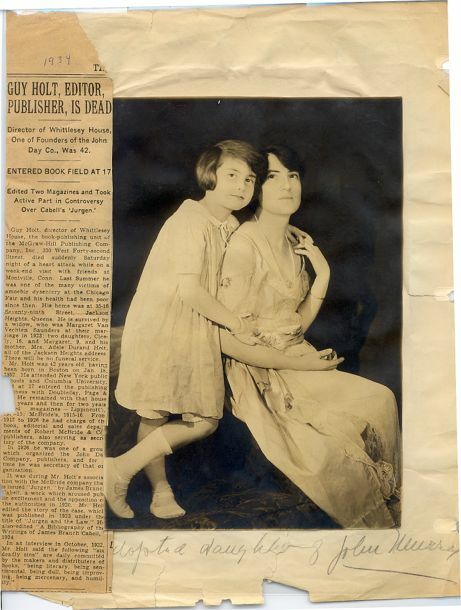 Either Guy Holt had a third wife, named Beth Murry, apparently with a girl child, or Caroline Elizabeth Morse and Beth Murry are the same person, and the young girl in the photo with her is probably Cicely Holt. This latter hypothesis is thought to be the more likely. This suggests that the wording of line 1 on p. 387 should be conservatively changed to "22 May 1912, Caroline Elizabeth ["Beth"] Murry [Morse], adopted daughter of John Murry, and had a daughter" until further evidence emerges to clarify the exact situation. [See figures]. 5) 25 Nov 2003: p 202, paragraph 2, line 1: change "16 August 1822," to "16 May 1822,". 6) 15 Dec 2003: p 141, person 201, lines 2-4: change to "June 1869, married (1) 16 July 1803, Springfield or Jefferson Village, Essex Co., New Jersey, John Baily [Bailey], and perhaps married (2) David Tichenor." Insert the following at the beginning of footnote : "Centinal of Freedom, 27 September 1803, NJHS: "Durand, Lydia | dau. 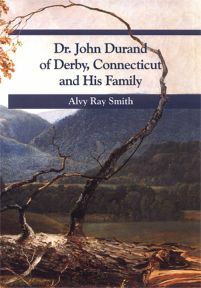 of John Durand | to | Bailey, John | by | Rev. Mr. William, at Jefferson Village;" biographical card file, NJHS: "Baily, John | married 7/16/1803 to Lydia Durand by Rev. Ger-|shom Williams, Springfield | Co. C. Essex;"." Henry Wilson ["Bill"] and Dessa6 (Durand) Gorham with sons James7 and Wilson7 (from the collection of Sandra8 Lee Filleman, caption on back of photo: "Bill Gorham, Dess (Aunt Dess) + Jimmy + Billy"). Maud6 Durand and her nephew Charles7 Gorham, son of Dessa6 (from the collection of Sandra8 Lee Filleman, caption on back of photo: "Maud Durand with Charles Gorham"). Despite the caption, comparison of the two women in these two photographs suggests they are the same woman, Dessa. William Sherman and Amanda S.5 (Durand) Brown with grandson Alpheus William7 Thoroman (from the collection of Eric Donald10 Thoroman, caption on back of photo: "Front: William Sherman Brown (1822-1898) Amanda S. (Durand) Brown (1823-1895) Back: Alpheus William Thoroman (1874-1942) Circa 1893 Rosedale, Ill. (Jersey County)"). Samuel Relf8 Durand, 1904-1996, ca. 1979 (from the collection of Derek10 Doran-Wood). 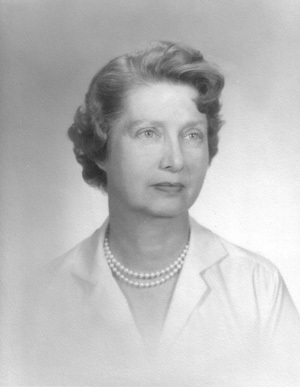 His wife, Hildur (Richardson) Durand, 1909-1997 (from the collection of Derek10 Doran-Wood). For further details see durand_cup.htm and also DurandCup.html. 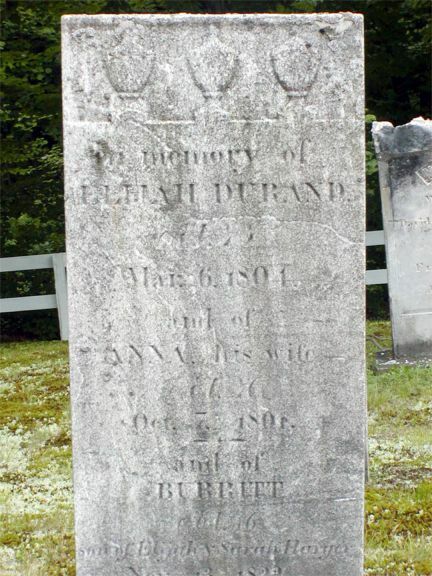 Gravestone, Oxford, Connecticut, for Elijah3 Durand, his wife, Anna, and a grandnephew, Burritt [Burrett]5, grandson of Elijah's sister, Sarah3 (Durand) and Jabez Harger, via Elijah4 and Sarah R. Harger. From the collection of Marcie Winton. All materials here covered by copyright 2003-2005, Alvy Ray Smith (except for illustrations, where copyright resides with the various contributors). Book published 24 September 2003. Contents frozen 10 June 2003.